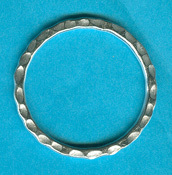 View cart “HF208 39-40mm Hammered Ring” has been added to your cart. Approx. 38-40mm x 2mm, 33-34mm hole, 6.1-6.5 grams. Stated price is based on 6.5 grams. Handmade of ~95+% silver by Karen Hilltribe silversmiths in Northern Thailand. Due to the handmade nature of these beads; size, weight and design may vary. Click here for larger image.